Earmarked for stardom ever since he burst onto the county scene with Leicestershire in 2005, Broad is the son of former Nottinghamshire and England opening batsman Chris. Stuart was shaping up to be a batsman with Leicestershire's youth teams when he had a growth spurt at 17 and turned his attention to seam bowling. Bowling from a height of 6ft 6ins tall, Broad swiftly proved to be a natural quick bowler, with pace, bounce and an aggressive approach. He was picked for England Under-19s and took 30 wickets in 10 first-class matches for Leicestershire in 2005. Fast-tracked into the England A team at the age of 19, he made his One-Day International debut in August 2006 and was named as the Cricket Writers' Club Young Cricketer of the Year at the end of that season. 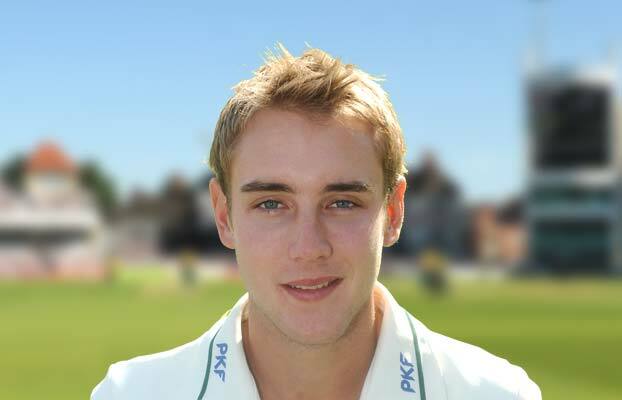 Broad's rapid progress continued in 2007 when he was named in England's World Cup squad and then finished as Leicestershire's leading wicket-taker in the county season. After announcing his decision to join Notts, his home county, for 2008, he helped England claim a 3-2 One-Day International series win in Sri Lanka and made his Test debut later in the winter, sharing the new ball with Notts team-mate Ryan Sidebottom. A virtual ever-present in the England Test team, he played a central role in the Ashes triumph in 2009 his international commitments restricted him to just 3 LV County Championship appearances for Nottinghamshire in 2008 and two in 2009.